An account of the spacey philosophical/mathematical territory charted by 20th-century European über-minds, from the perspective of Austrian-born Kurt Gödel, supported by Albert Einstein. Yourgrau (Philosophy/Brandeis) devotes the bulk of his text to the birth and academic life of “the Gödel Universe” (the forgotten legacy to which the subtitle refers), a radical cosmological view made plausible by Einstein’s theories. In the magical, rotating Gödel Universe, time is merely another sort of space, and therefore an actual rocket ship could, if it goes fast enough, travel back in time. It’s an unpopular theory, and the author gives ample attention to its detractors while remaining an unabashed cheerleader for Gödel. (Stephen Hawking is one of the more prominent members of the opposition, which Yourgrau blithely attributes to the theory’s shocking implications.) 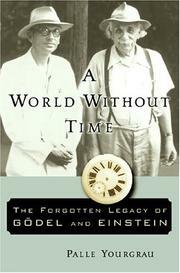 When he writes of real space and real time, the author does a superb job of portraying the thinkers from a human perspective, describing Gödel as “gaunt, harrowed, and haunted, peering through thick glasses like an owl from another dimension.” He depicts Kurt and Albert as complementary entities, despite their contradictory characters. Both German speakers made multiple visits to sanitoria over their lifetimes, but Gödel was a theist, baptized Lutheran, whereas Einstein was a culturally Jewish, “deeply religious unbeliever.” Einstein was a fan of Beethoven and Mozart, Gödel of Disney's Snow White and the Seven Dwarves. Unlike James Gleick’s Chaos (1987) or Simon Singh’s Fermat's Enigma (1997), which both effectively make high-level intellectual concepts understandable to the average reader, Yourgrau’s narrative displays less concern for pandering to nonacademic stragglers. At times it reads like the account of a scholarly hockey game; after an idea has passed from Leibniz to Wittgenstein to Goldfarb to Frege to Husserl to Capek and back, it’s easy to lose track of the goal. And that’s not the only reason many readers, even science buffs, will be left in the space dust. Intellectually provocative, of more interest to scholars than the general public, but accessible to the motivated sub-genius.